FOOTBALL–Six matches will be played this evening in different playgrounds across the country as the Uganda Premier League 2017/18 season kicks off. In one of the most anticipated season starts in recent history, their will be matches played in Kampala, Entebbe, Masaka, Jinja, wakiso and Arua on the first day. Two-time defending Champions KCCA FC will start the defence of their title at home to new comers Maroons FC. Speaking at a pre-match press briefing yesterday, KCCA FC head coach Mike Mutebi, who has won five major trophies in the last two years, cited defending the league title as the target this season. “Our ultimate target as a club is to defend the league and that means being better in every match than we were last season,” he said. Mutebi who signed 11 new players in the off season also said that despite notable key departures, he believes the young players he has brought in can very much do the business. “The media and some sections of the fans have continuously questioned our activities in the transfer market but I guarantee that the boys will do the job well effective tomorrow,” Mutebi said. Derrick Nsibambi (right) and Paul Mucureezi (left) are both expected to start for KCCA at home to Maroons as the season stars. Photo by Shaban Lubega. 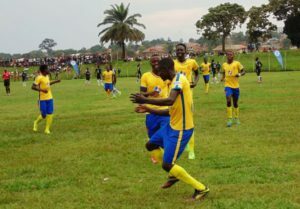 KCCA FC who successfully defended the Uganda Cup last Saturday will have no major injury scares going into the game apart from midfielder Jackson Nunda who has been nursing an injury in the last couple of weeks and is not expected to feature. Meanwhile, Maroons have been in the news for all the wrong reasons, especially that they are set to start the league minus a head coach after Asaph Mwebaze, the man responsible for bringing top flight football to Luzira again threw in the towel and will be expected not to trouble KCCA so much. Maroons saw a couple of influential players like goalkeeper Jamal Malyamungu and last season’s big league top scorer move on(to KCCA) with no proper replacements. •KCCA FC vs Maroons FC @StarTimes Stadium 4:30pm. •Bright Stars FC vs Vipers SC @Champions Stadium 4:30pm. •BUL FC vs Mbarara City @Kakindu Stadium 4:30pm. •Masavu FC vs Police FC @Fisheries Traning Institute Play Grounds 4:30pm. •Onduparaka FC vs Proline FC @Green Light Stadium 4:30pm. •SC Villa vs Soana FC @Masaka Recreation Grounds 4:30pm.